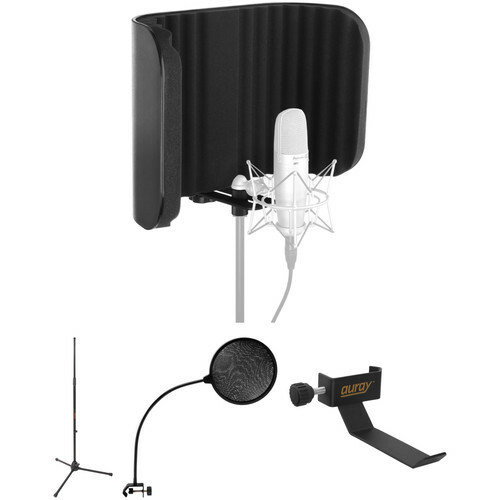 The Auray Acoustic Isolation Vocal Kit from B&H features an Auray RF-CPB-18 plastic reflection filter with mounting hardware, an Auray MS-5230 tripod microphone stand, an Auray PFNY-6 clamp-on microphone pop filter with 13" arm, and an Auray COHH-2 clamp-on headphone holder for a mic stand. The kit can be used to create clean vocal recordings in less-than-ideal recording environments. The reflection filter features high-density, open-cell acoustic foam wrapped in an ABS-plastic curved screen. The included mounting hardware provides height and depth adjustments for precise microphone placement. The 5/8" adapters are compatible with most microphone stands, clips, and shockmounts. This kit is also ideal in desktop recordings for broadcast applications. Furthermore, the kit's MS-5230 mic stand is built of durable, steel construction with an ergonomic twist-action clutch that adjust the height of the stand from 36.2 to 63". Additionally, the PFNY-6 clamp-on microphone pop filter with 13" gooseneck arm is essential for recording vocals and is necessary to tame the sibilance and pops that are produced by the human voice. Finally, the COHH-2 is a clamp-on headphone holder that easily attaches to a microphone stand measuring up to 1.2" in diameter, and it provides a hanging hook that supports two pairs of studio headphones. Designed to help create clean vocal recordings in less-than-ideal recording environments, the plastic RF-CPB-18 Reflection Filter from Auray absorbs and diffuses external noise and room reflections. It can be used in any recording scenario that requires microphone isolation, such as tracking in an acoustically untreated room, untreated rehearsal spaces, project and home studios, and professional studios where additional isolation is needed. The filter features high-density, open-cell acoustic foam wrapped in an ABS plastic curved screen. Its front sliding bracket and rear adjustment rail easily allows you to adjust its height and depth for precise microphone placement. Thanks to its standard 5/8"-27 threaded adapters, the RF-CPB-18 is compatible with most microphone stands, clips, and shockmounts. It is also ideal for desktop recording and broadcast applications when used with a desktop mic stand that features a weighted metal base (not included). The lightweight, 3-pound body lends to portability while its ABS construction assures its durability. The Auray MS-5230 Tripod Microphone Stand features durable, steel construction. An ergonomic twist-action clutch adjusts the height of the stand from 36.2 to 63", while the reinforced tripod base and non-slip feet keep it firmly and sturdily in place. The Auray MS-5230's tripod base collapses for easy transport. Designed for use with microphones, the Auray PFNY-6 is a pop filter that minimizes vocal plosives and reduces errant breath noise. It's suitable for home and pro studios alike, and lends itself to all sorts of recording applications, including sung vocals, voice-overs, broadcasts, and podcasts. The PFNY-6 utilizes a double-layered nylon screen, affording a clear view of the capsule; thus, the PFNY-6 won't impede a vocalist from giving a robust-sounding performance, captured on-axis. Additionally, this screen protects your microphone capsule from corrosive moisture. Its 13" flexible gooseneck will give you plenty of room to maneuver, allowing you to place the screen as close to the capsule as you'd like. A sturdy C-clamp with a thumbscrew fastener protects against slippage, while a rubber grommet and padding protect your mic stand's finish. Anyone who has recorded vocal tracks knows what the sound of p and b can do to the take when a microphone is left unprotected. This double-layered nylon screen dissipates the rush of air caused by vocal plosives, thus minimizing the popping sounds that can compromise your recording. By minimizing vocal plosives, vocalists can move closer to the microphone and train their voice directly on the mic capsule for a more rich, centered, warm, and robust track. In addition to protecting your take from vocal plosives, the PFNY-6 protects your mic capsule from corrosive moisture. The PFNY-6 is outfitted with a sturdy C-clamp that attaches easily to a mic stand or mic boom. Its thumbscrew fastener adjusts to most sizes, and the rubber grommet won't scratch your mic stand's finish. Box Dimensions (LxWxH) 19.0 x 14.0 x 8.0"
Box Dimensions (LxWxH) 14.4 x 6.4 x 0.4"
Acoustic Isolation Vocal Kit is rated 5.0 out of 5 by 1. Rated 5 out of 5 by ASA from Very useful product to me I have to record some voiceovers from time to time, but I dont have an excellent isolated and treated acoustic room. Then I had a lot of sound reflections and my audios were so awful. But with this kit I have leveled up the sound quality of my audios. Im very pleased with this product.